An artist who focused on democratic subject matter in modern American life, Bellows was one of the most talented realists working in the first quarter of this century. While he is best remembered for robust scenes of New York City- from gritty construction sites and congested tenements to boys skinny dipping off docks and sprawling prizefighters locked in combat- he was also an accomplished painter of portraits and landscapes. Personally energetic and athletic, Bellows conveyed a physical directness in his canvases through rich application of paint and expressive use of color and light. The White Horse was painted in November 1922, about two years before Bellows's tragic death from appendicitis at age forty-two. 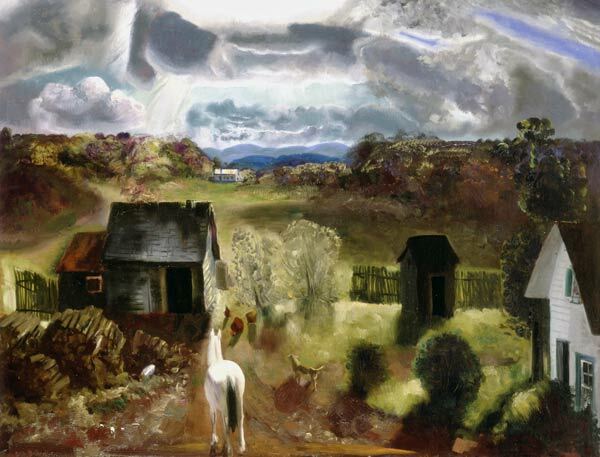 It depicts a farm near Woodstock, New York, an artist's colony in the Catskills where Bellows and his family had summered and where he had just built a house and studio. The vivid autumnal color and the dramatic contrast of strong light and deep shadows created by the passing of heavy clouds lend an air of mystery and dynamism to an otherwise ordinary rural scene.